I would love to take a better picture of the shop front, but in the afternoon when I reached, a male customer with cling wrap around his head (super unglam moment) was standing right outside, smoking and when I left, a car was conveniently parked outside. Oh well, just not my day for phototaking. The salon is kept minimalistic and chic with a single, long stretch of white chairs with brown laminated mounted table. It seems like housekeeping is also one of their top priority as you can hardly find any trace of hair on the floor and all their hair gadgets are kept in an organised manner, lined up side by side on the shelves. The best part about The Comb is that they actually do have a printed menu, listing not only all their hair services but also their choice of beverages available for their patrons while waiting for their hair to be done. And of course, I took a coffee! Those chocolate candies were yummy too, by the way. And of course, I chose to dye my hair again (wanted to try a perm but was advised to save my dying ends first). My best ally against my ever-greying hair. The senior stylist, Henry, was really patient while I was being indecisive with the choice of colour. And eventually, I went with a pink tone and Henry decided to 'ombre' it with red ends to give it a more vibrant look. And as usual, my long and thick mane almost gave their junior staff a mental breakdown. While helping with applying the hair dye cream, their jumbo hair clips couldn't even hold my hair up properly. And while helping to wash and blow dry my hair, he eventually blurted out, "Can I ask, how do you maintain this?" His exasperations aside, my hair was still well taken care of and nicely 'ombred' by applying different shades of hair dye in 3 steps. A brighter pink tone to my black roots, the exact shade of pink tone I've chosen to the middle section of my pre-dyed hair, and a shade of red to my hair ends. And to make up for my disappointment of not being able to perm my ends, Henry offered to style my hair after the haircut and gave me pretty curls! I have to say, T absolutely loved this. He was so disappointed when I told him the curls will be gone by the next day and agreed without a 2nd thought when I said, "You want these to be permanent? Give me $300!" Not forgetting to take a picture with Henry before leaving. 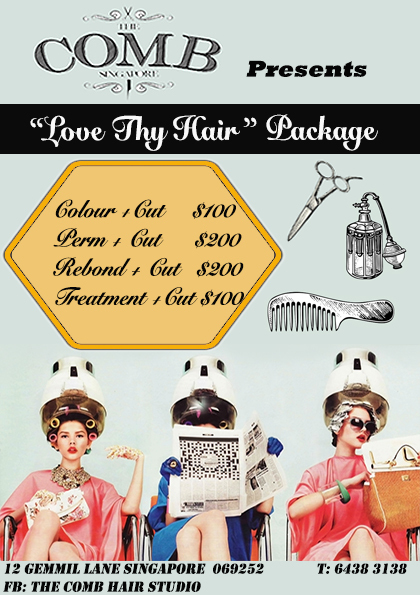 And of course, The Comb is currently having an awesome promotion right now if you're looking to colour, perm, rebond your hair, or pamper your tresses with a treatment session. 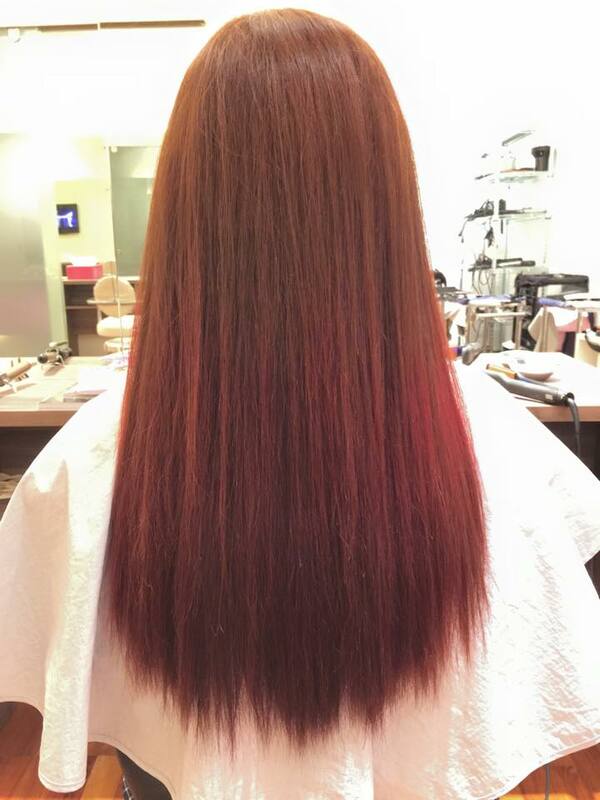 Promotion does not have a limitation on hair length, and tentatively ends in July, so do call them beforehand to confirm when you're planning to make your way down. For more information on The Comb, do visit their website HERE. Women's hair care is a must that cannot be forget daily. Salon could beautify it accordingly to the best of their expertise. Love your hair! The color and the curls are so pretty. Funny your story about the man with the head wrap smoking that interfered with your perfect photo. That can happen, right? And sometimes that perfect moment never happens again. The best thing about this is that this session was free! Oh I would love to have curls like that permed on me! Myhair just won't curl too long, I've tried. Great result and you look good with the curl. wow you are so lucky to get this kind of invitation for a make over... i wonder if they also do makeover for men .. I love salons that offer beverages to their customers and those that have wifi too. I love your hair and the curls, Henry did a fab job. First of all, I love the name of the hair studio. Very simple yet there's a brand recall. Anyway, love your highlights. I'm also planning to change my hair style and if only Comb is near me, I'd have my hair done with them. They did a great job! Both the cut and colour as well as the styling and curls. You looked great! Great curls! How long will it last? Props to Henry. Good call on the ombre effect. You look great with the hairstyle. The curls added body to your hair and made you look younger. 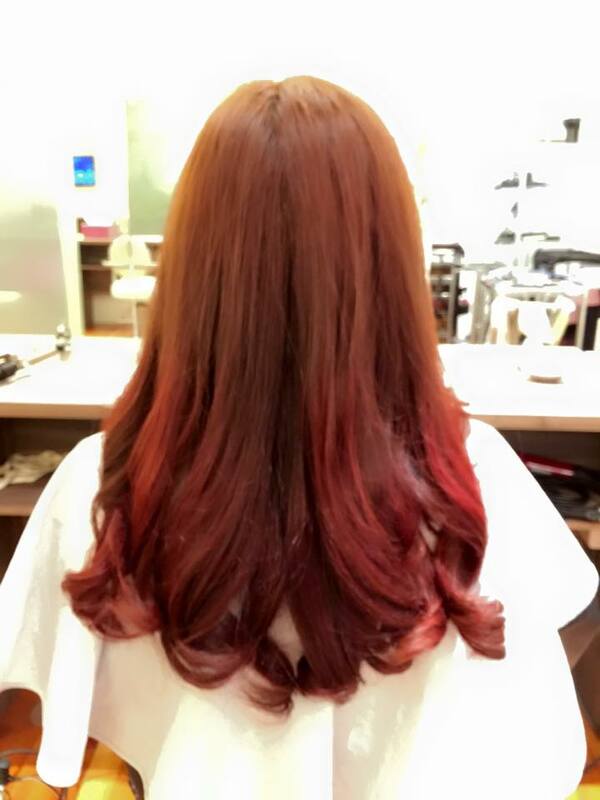 Your ombre looks so good! Did it stay long? I always have difficulties with red dyes not staying for more than two weeks, was it the same for you? Wow, your ombre gradient was very smooth and beautiful! Love the bronze hair followed by the red! Thanks for sharing! Hope to know how long the colours last! I prefer you in the soft curls, you look more feminine. Overall it was a good result. Your hair is gorgeous! And I liked the style of the salon. It’s exactly the type of place where I’ll go for a trim or styling. Evolving hair styles and new hair trends have revolutionsed this sector...and it is constantly evoloving.